Raye Jean Jordan Montague, a registered professional engineer, was incredibly influential in transforming the field of marine vessel construction. A longtime employee of the U.S. Navy and a leader in its transition to the use of Computer-Aided Design and Computer-Aided Manufacturing (CAD/CAM), Montague created the first computer-generated rough draft of a U.S. naval ship in 1971. Amazingly, she completed this undertaking in only 18 hours, despite being given one month to do so by her department. For this achievement and others, including being the navy’s first female program manager of ships, she is now celebrated as a “hidden figure,” joining the recently-recognized group of African American women who played a key role in advancing the U.S. space program. Born on January 21, 1935, in Little Rock, Arkansas, Raye Jean Jordan, daughter of Rayford Jordan and Flossie Graves Jordan, knew from a young age that she wanted to be an engineer. At the age of seven, she visited a German submarine that had been captured off the coast of South Carolina and was immediately fascinated by its mechanics. She soon set her sights on developing the technical skills necessary to work on such vessels but faced significant discrimination owing to her race and gender. Despite these barriers, she excelled academically, graduating from Merrill High School in Pine Bluff, Arkansas in 1952. Soon thereafter, she enrolled at Arkansas Mechanical & Normal College (now the University of Arkansas at Pine Bluff), completing a degree in business in 1956. At the time, black female students at the school could not pursue a degree in engineering, which was typical for the era. After earning her B.S., Montague moved to the Washington, D.C, intent on starting her career. Her first interview in 1956 was with the U.S. Navy. She was initially hired as a clerk typist but quickly rose through the ranks, becoming a digital computer systems operator at the navy’s David Taylor Model Basin in suburban Maryland. 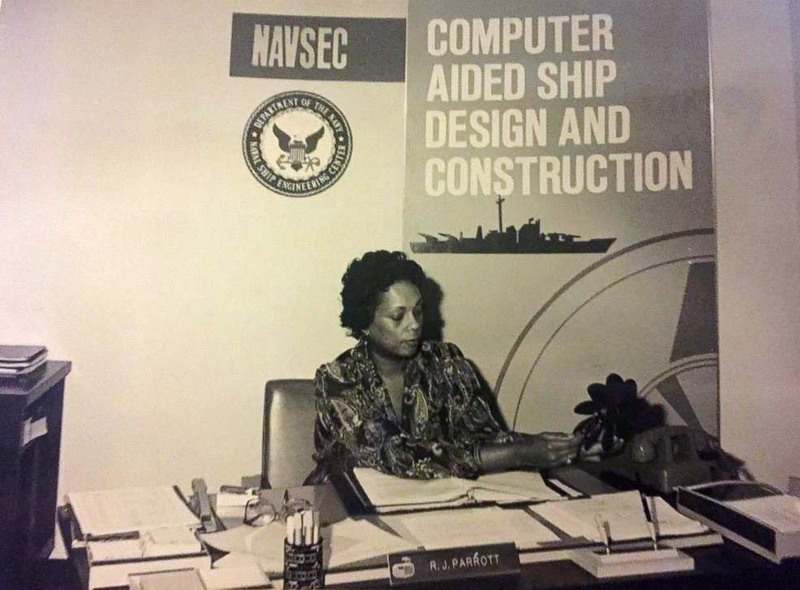 During this period, Montague taught herself computer programming, gaining the requisite skills to design naval vessels. As her expertise grew, she earned numerous promotions, becoming by 1962, a computer systems analyst at the Naval Ship Engineering Center and then a program director for the Naval Sea Systems Command. She also held management positions with the navy’s Computer-Aided Design and Computer-Aided Manufacturing (CAD/CAM) Program and its Information Systems Improvement Program. In 1972, the navy awarded Montague its Meritorious Civilian Service Award. She received this high honor in recognition of her breakthroughs in computer-aided ship design, including the singular achievement, in 1971, of revising the first automated system for selecting and printing ship specifications. This allowed her to produce a draft for the FFG-7 frigate. Additional awards include the Society of Manufacturing Engineers Achievement Award in 1978 and the National Computer Graphics Association Award for the Advancement of Computer Graphics in 1988. Montague retired in 1990 and lived in west Little Rock, Arkansas, where she was active with several local nonprofit organizations as well as the local school system. The Innovation Press released a new children’s book based on Montague’s life, The Girl with a Mind for Math: The Story of Raye Montague in 2018. Montague passed away on October 10, 2018 of congestive heart failure. She is survived by her son, David R. Montague. Betty Sorensen Adams, “Raye Jean Jordan Montague,” The Encyclopedia of Arkansas History and Culture, http://www.encyclopediaofarkansas.net/encyclopedia/entry-detail.aspx?entryID=5565; Melinda McAdams, "Computer graphics pioneer guides CAD-CAM for Navy," Metalworking News, March 28, 1988, p. 5; “Raye Jean Montague Shares Life Story of Overcoming Gender, Racial Barriers, The Pine-Bluff Commercial, April 2, 2015, http://www.pbcommercial.com/news/local/raye-jean-montague-shares-life-story-overcoming-gender-racial-barriers. Betty Sorensen Adams, “Raye Jean Jordan Montague,” The Encyclopedia of Arkansas History and Culture, http://www.encyclopediaofarkansas.net/encyclopedia/entry-detail.aspx?entryID=5565; Melinda McAdams, “Computer graphics pioneer guides CAD-CAM for Navy,” Metalworking News, March 28, 1988, p. 5; “Raye Jean Montague Shares Life Story of Overcoming Gender, Racial Barriers, The Pine-Bluff Commercial, April 2, 2015, http://www.pbcommercial.com/news/local/raye-jean-montague-shares-life-story-overcoming-gender-racial-barriers.